Brmmmmmm, brmmmmm, where to mate? Hurry up, meter's running. 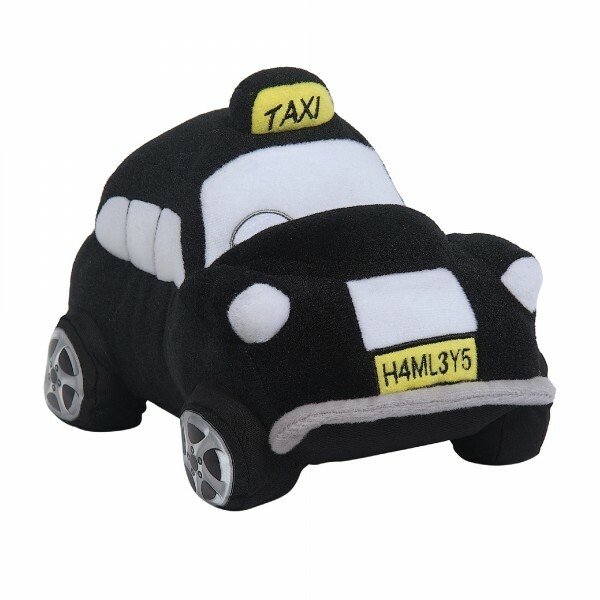 The traditional black cab of London gets a Hamleys makeover in this soft toy/child-friendly keepsake. Destination? Hamleys of Regent Street, of course. The Hamleys Soft Taxi is suitable for children aged 3 years and over. Answer : Shipping is based either on the number of products and the size of the products you purchase or the monetary value of your order. You will see the shipping prices during the check out process before placing your order. Answer : Hamleys strives to fulfill orders as soon as possible. Under normal circumstances, it takes approximately 2-5 working days from when an order is placed until it is dispatched for delivery. For payment by EFT / deposit, no dispatch occurs until the money has cleared. Our couriers require a further 3-8 working days from date of dispatch. Some deliveries may take longer if your location is far from a Main City Centre. Should an order be particularly heavy or bulky, an additional working day may be required. If an item is out of stock, an email notification containing a stock ETA will be sent to you. You will be given the option of either waiting for the item or requesting a refund. Approximate time taken from dispatch to the receipt of goods. Answer : You may be requested on delivery to produce your ID and / or credit card for fraud prevention purposes. Also please note that deliveries will only take place during business hours unless special arrangements have been made. Answer : Once Hamleys has dispatched your order, we will send you an email containing the courier tracking number for your order. (We will also include our courier contact details).